On the left is a photograph I took a few days ago of the final resting place of Robert the Bruce, King of Scots, in Dunfermline Abbey. Incredibly, the man, who more than any other helped Scotland gain its independence, was actually lost to the world for hundreds of years. Of course, the seminal moment which ultimately led to Scottish independence was the two-day Battle of Bannockburn in 1314, where a vastly outnumbered Scottish army led by Robert the Bruce defeated the military might of an English army which was at the time, arguably, the most powerful in all of Europe. This bloody battle showed once and for all Scotland would not be conquered. But independence itself would have to wait for another 14 years with the signing of the Treaty of Edinburgh-Northampton in 1328 which finally brought to an end the more than three-decades-long First War of Scottish Independence. However, the treaty unravelled a mere four or five years later, presaging the start of the Second War of Scottish Independence which lasted some 25 years. But even at its end in 1357, Scotland still retained its independence, a status enjoyed by the country until 1707 and the Treaty of Union, an agreement between the parliaments of England and Scotland which led to the creation of Great Britain. It almost goes without saying the above is just an outline of just some of the fascinating events taking place during an extremely turbulent period of both English and Scottish mediaeval history. 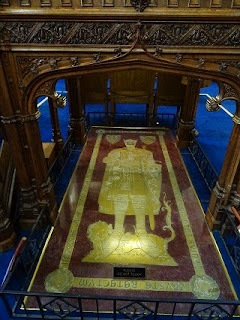 After Robert the Bruce died on 7 June 1329, aged 54, at the Manor of Cardross, near Dumbarton, his heart was removed prior to his body being embalmed and then buried in Dunfermline Abbey. King Robert's greatest wish had been to go on a crusade to the Holy Land before he died. But when he knew this wasn't to be, he instructed Sir James Douglas to take his heart on a crusade instead. Douglas placed Bruce's heart in a silver casket on a chain which he wore around his neck. When no crusade materialised, Douglas, along with a number of other Scottish knights, headed for Spain to fight against the Moors and was killed at the Battle of Teba. According to legend, Douglas, outnumbered by Moorish cavalry, took the casket from around his neck and threw it into the midst of the enemy. As he bravely fought to follow his king and retrieve it, he was cut down. Later, after the battle was over, Douglas's body was found along with the silver casket and both were returned to Scotland. In line with his wishes, Robert the Bruce's heart was buried in Melrose Abbey, in a part of Scotland he loved dearly. 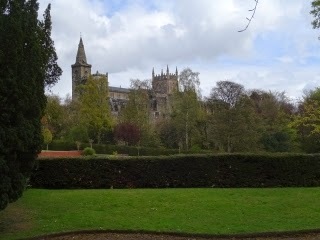 In 1818, the long-lost vault containing the body of Robert the Bruce was discovered by workmen building the new parish church at Dunfermline, which is on the site of the ancient abbey there. The vault contained the remnants of an oak coffin and the skeletal remains of a body enclosed in lead, with fragments of a shroud made of gold cloth around it. Over the head, the lead had been shaped into a crown, leaving little doubt as to whom the remains belonged. From the length of the skeleton, too, it was estimated Robert the Bruce must have stood at just over 6 feet tall, making him a giant among men in mediaeval Scotland where the average height would have been something around 5 feet 4 inches. Later, further inspection revealed the sternum had been sawn to enable the removal of the heart, providing further confirmation of the skeleton's identity. 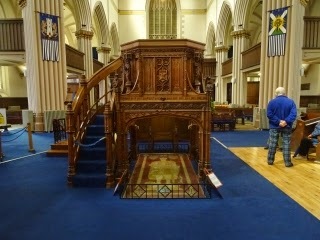 In a ceremony befitting a former king of Scotland, Robert the Bruce's remains were placed in a new lead coffin and re-interred in the vault at Dunfermline Abbey in 1819. Strange to say, Robert the Bruce's heart was also lost for hundreds of years, too, until the chance discovery of the casket by archaeologists in 1920. Unfortunately, when they reburied it, they forgot to mark its location. During construction work in 1996, however, the casket was uncovered once more, and following scientific analysis confirming it had indeed contained human tissue, was finally reburied in Melrose Abbey in 1998.